Hybrid graft suture less technique for visceral branches during open thoracoabdominal aortic aneurysm repair. 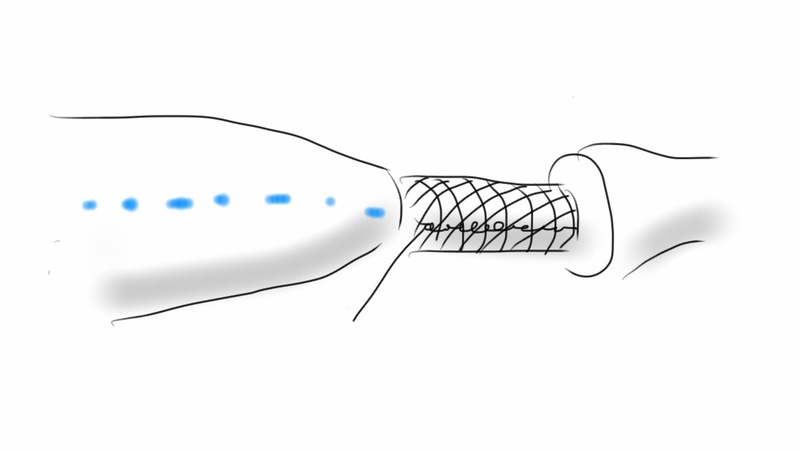 Dr. Roberto Chiesa from Italy presented his experience in 61 renal arteries using the Gore hybrid graft today at the Veith Symposium The graft which I sketched above on my phone is their PTFE graft terminated in a Viabahn configuration. He reports a 10% acute renal failure rate and 90% primary patency in followup. This is something I’ve considered but never tried because the one extra anastomosis doesn’t add all that more time especially if a branched graft is used. Will revisit this concept. Dr. Debus presented using this graft in a later talk for debranching visceral arteries in hybrid repair of TAAA.